Our Monday Daily Shot StoryCorps series is devoted to sharing conversations about Wellesley's effect on the lives of its students and alumnae. 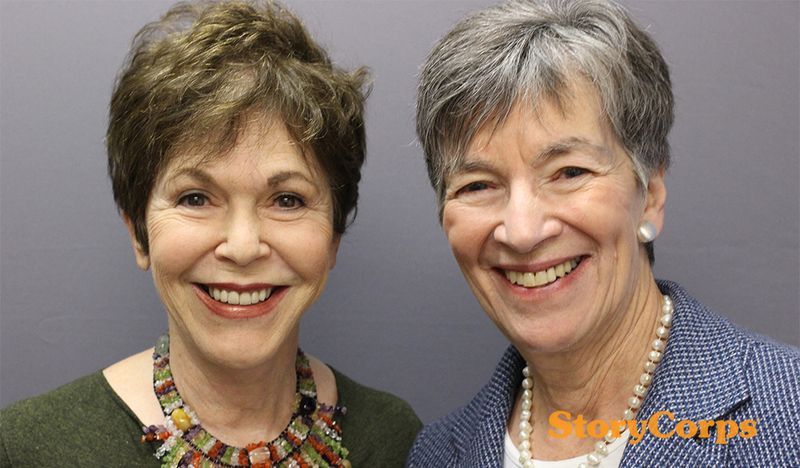 This week, we present a conversation between longtime friends Linda Salzman Gottlieb '60 and Nicki Newman Tanner '57. Gottlieb shared the frustrations she encountered in regard to sexism after graduation, and together they discussed how Wellesley prepared them to make their voices heard. "As I think back upon my life," Gottlieb said. "I think that that courage to speak up—certainly the attitude, a certain ability to be irreverent—was formed at Wellesley, by the professors, who would literally say, 'Speak up, Ms. Tanner. Speak up, Ms. Salzman. Speak up.' Your voice was encouraged, and that confidence gained among sisters..."
"...You could do anything you wanted," Tanner said. "That, to me, was the most liberating idea that you didn’t have to compete with anything but your own best self."